To contribute our maximum in "DIGITAL INDIA" vision, we have presented this eMarket Place/eDelivery Service Portal. Here Customer's truly personalized service is always our top priority. We ensure that products are collected or arranged from best & trusted brands/suppliers/manufacturers/seller and delivered at your doorstep to save your time. We have just started from FRESH FRUITS& VEGETABLE and CUT-PEELED FRUITS & VEGETABLES and Hoping that we will be able to provide you more category products or services on our eMarket Place/eDelvery Service Portal shortly. You have to just Click a Button and thereafter its our pleasure to serve you at your door step by saving your time and money. We have exclusive & trendy selection for you on our eMarket Place/eDelivery Service Portal. We are also committed to timely delivery and the money saving online deals so that we can be on top in your choice list. Online shopping with EShoppingHub is a very easy and delightful experience. So Start right now !! Make EShoppingHub best eMarket Place/eDelivery Service Portal. Serve you exclusive & best quality product. Make Truly Personalized customer service. Establish sweet relationships with our customers as well as suppliers/sellers/manufactures/service providers. Contribute our maximum to Make Our India DIGITAL INDIA. Here at EShoppingHub we respect your faith & trust on us. Even we never want to think about to loose that. To be continued on top in your choice list, we have putted our all terms & conditions openly. You can visit at "Footer" section of website OR left/right section of Mobile Application to read all the terms & conditions and policies. Online By Mobile Applications (24x7). For more detail Please Refer "Delivery & Returns". 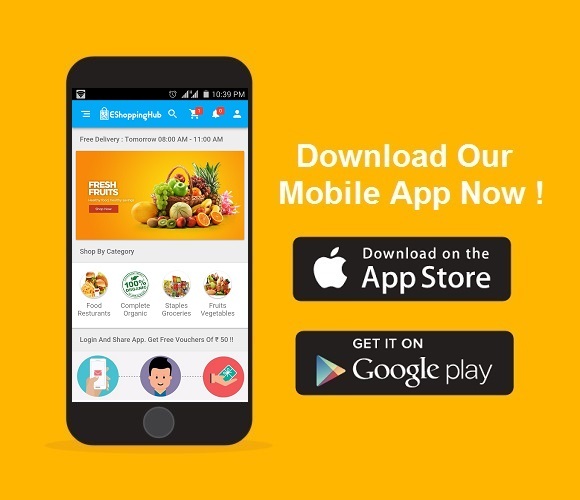 1-KARNAL CITY, HARYANA : Listed Areas for Free Delivery (are subject to qualify minimum order limit) are MODEL TOWN, DAYANAND COLOY, BASANT VIHAR, SAINI COLONY, ASHOKA COLONY, JARNELI COLONY, NEAR KARAN GATE, MUGAL CANAL, DAYAL SINGH COLONY, KUNJPURA ROAD, INDRA PURAM, MALL ROAD, NAYAYPURI, NDRI, NBGAR, ICAR, GEHOON VIHAR, NEAR CLOCK TOWER, NEAR KARAN GATE, NEAR GHODA CHOWK, NEAR NAMASTE CHOWK, NEAR MEERA GHATI CHOWK, CLUB LANE, KALPANA CHAWLA MEDICAL COLLEGE, NEAR ROADWAYS BUS STAND, NARSI VILLAGE AND HUDA SECTORS 3, 4, 5, 6, 7, 8, 9, 12, 13, 14, 32. Our Customer can make Faster, Secure and Easy Online / Offline Payment to us by using any one of below give methods. *Monthly Payment option is available only for EShoppingHub Prime Members. CONCEPT OF "NO STORAGE-ONLY FRESH DELIVERY"
We do not store or freeze the fruits and vegetables in any case at our store or office. We procure the fruits & vegetable every day morning from 05:00 AM to 07:00 AM equal to yesterday's ordered quantity from Local Best Subzi Mandi and get packed the same from 07:00 AM to 08:00 AM and start delivery from 08:00 AM to 10:00 AM. So by this practice we ensure NO STORAGE - FRESH DELIVERY concept.